BSN Nitrix – The #1 selling Nitric Oxide product! Buy 2 and SAVE even more at Bodybuilding.com! BSN Nitrix is one of the best nitric oxide boosting supplements I have ever taken. After about two weeks of consumption I started to see increased vascular dilation and pump during my workout. I am no scientist but I believe that this supplement is very similar to the science in Viagra… That being said, be prepared for increased enthusiasm in other places outside the gym. 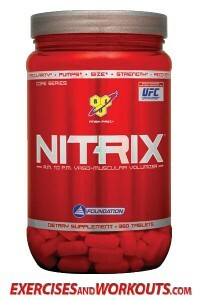 Get your BSN NITRIX now at Bodybuilding.com! As soon as I hit the gym my muscles would pump so full of blood it felt like my muscles were trying to tear out of my skin! Arnold said it best in his movie Pumping Iron “…it feels fantastic” in reference to the muscle pump, not Nitrix. But it will give you that same fantastic feeling. With everything being said I highly recommend this supplement if you can afford it. I also recommend stacking it with a pre-workout drink, like XtremeNO or any other pre-workout drink of your choice, and some form of creatine. I am currently using USPLabs Jack3d and Kre Alkalyn creatine pills. This entry was posted in Bodybuilding, BSN Nitrix, Supplement Review and tagged bodybuilding supplements, nitric oxide by Russell Jensen. Bookmark the permalink.